As Christine Blasey Ford's historic testimony before the Senate last week grows weaker by the day, a man who was in a six-year-long relationship with Judge Kavanaugh's accuser has given a sworn testimony that directly contradicts Ford's statements. 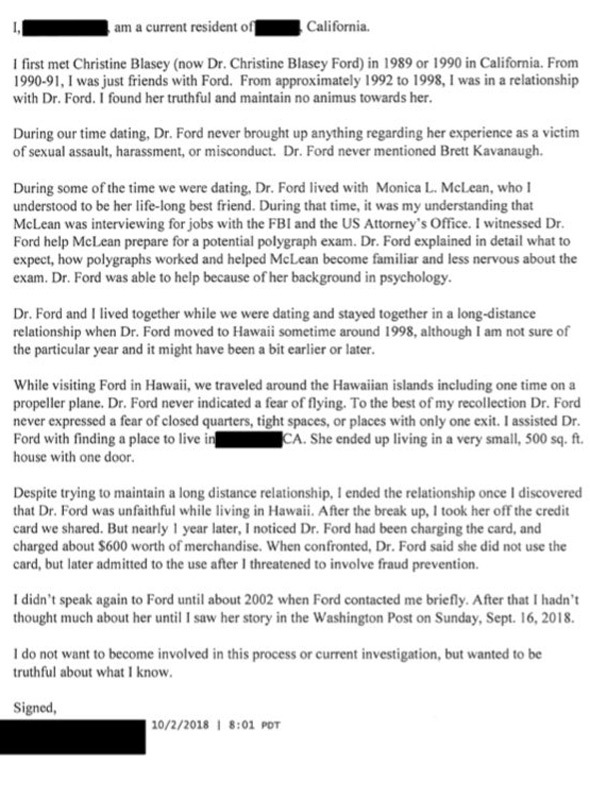 The unnamed man, who was in a relationship with Dr. Ford from 1992 to 1998, has testified that she once trained a close friend using her psychology training to prepare for a polygraph test. 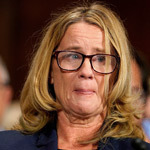 The California man declares in a sworn statement to the Senate Judiciary Committee dated Tuesday, that Ford also has no fear as flying, nor does she have any fear small spaces or rooms with single exits. 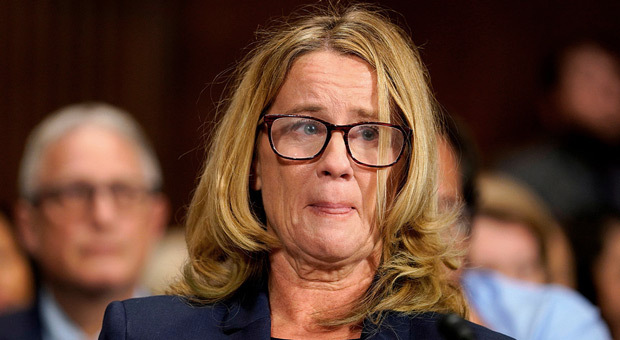 Ford's ex says he met the then-Christine Blasey “in 1989 or 1990,” and later became romantically involved with her for around six years from 1992 to 1998. 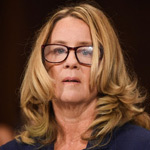 The man claims to have witnessed Ford, who was studying psychology at the time, coach a close friend as she was preparing for government-administered polygraph exams. 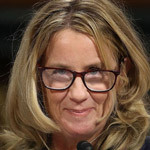 The alleged ex-boyfriend also claims that Ford frequently flew, including in small propeller aircraft, without complaint over the course of their relationship and had no fear of small spaces or rooms with only one exit. 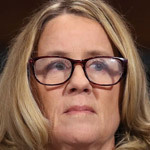 Ford’s claims that phobias of these things have plagued her since the early 1980s as a result of a 17-year-old Kavanaugh attacking her have been central elements of her story. 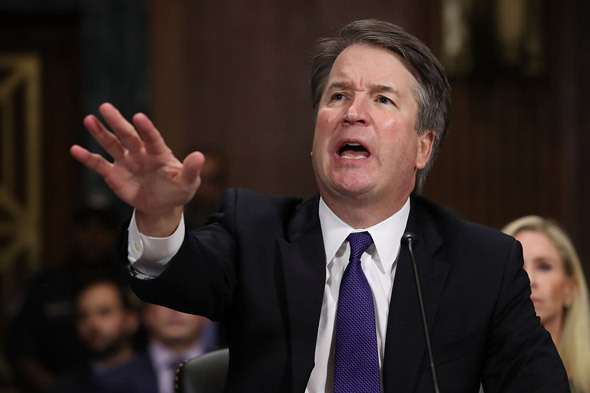 Further, the man claims Ford never mentioned being a victim of sexual assault in the eight years they knew each other and never once mentioned Kavanaugh’s name. Finally, he claims their relationship ended amid infidelity and credit card fraud on her part. 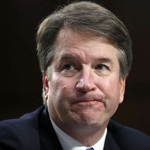 He does, however, claim that he “finds Ford believable” and did not “want to become involved” with the investigatory process. Exactly when the Senate Judiciary Committee staff came into possession of the letter is not clear. Mitchell’s specific questioning about polygraph preparation during Ford’s committee testimony, however, may indicate committee staff had some knowledge of the allegations laid out in the letter at least as early as last week.